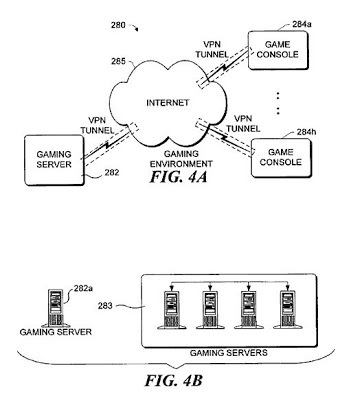 The ‘028 patent seeks to make it easier to join friends during online gameplay. With this invention, the player has the option to select “Quick Join,” which causes the online service to instantly place the player in the game with his friends. The player also has the option to pull up his friends list and select a specific friend to invite to a game. Depending on the type of game his friend is playing the player will either be placed immediately in the game or he will have to wait for the current game to finish before he is placed in the game next round. The user who has signed onto an online gaming service can be immediately joined in playing an instance of a game with a friend appearing in the user’s friends list. After signing onto the online service, the user has the option to select “Quick Join,” causing the online service to immediately join the user in an instance of the game having an opening for the user and also being played by the first player found in the friends list. Alternatively, the user may selectively display the friends list and select a specific friend who is online, before activating the Quick Join option to immediately join in playing within the friend’s game. Depending upon the type of game, the user will either be immediately placed into play or joined to a portion of the game that enables the user to select options, so that the user can participate in the next session of the game. 1. In a computer gaming network that includes one or more gaming servers connectable through a network with a plurality of game consoles, a method of enabling a user of one of the game consoles to immediately join, at the user’s option and without the user having to first access any particular gaming friend’s online status, any of a plurality of the user’s remote gaming friends in playing an online game, the method comprising steps for: a user of one of the game consoles first logging online so as to access a gaming server in order to join in playing a selected game online; the gaming server then causing a user interface to be displayed to the user at the user’s gaming console, the user interface presenting a plurality of options for initiating or joining in an online game for the selected game, at least one of said options comprising a quick join option which, when selected by the user, in turn causes the gaming server to perform steps for: automatically causing the gaming server to launch a search of a friends list previously created and stored for the user in order to find the first friend in that list who is online playing the selected game; and thereafter, either i) enabling the user to select game options prior to joining in the online game, or ii) permitting the user to immediately join the first friend in playing the online game that is going on.